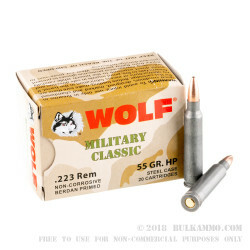 Bulk-priced for cheap varminting or target shooting, these .223 Remington cartridges are a great choice for your AR-15 or other .223 Remington rifle. 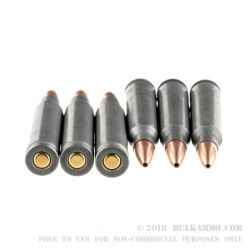 Each cartridge in this case of 500 (containing 25 boxes of 20 rounds each) fires a 55 grain bimetal jacketed hollow point with a simple, economical design that provides fragmentation on impact to bring down coyotes, and other pests. 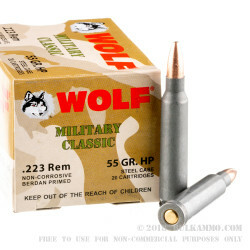 This Wolf ammunition is made in Russia using non-corrosive Berdan primers and steel cases. 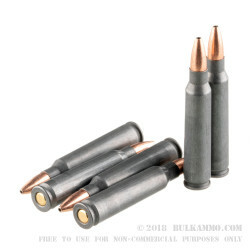 The steel cases cost significantly less than brass and, while not reloadable, offer reliable performance thanks to their polymer coatings. Excellent product I recommend them to anyone.